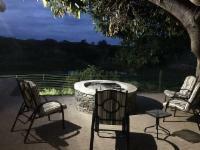 Welcome to Kruger Wild View Guesthouse. Kruger Wild View Guesthouse is your "unwind and relax", rustic, self-catering guesthouse on the bank of the Crocodile river, 5 meters from the Kruger National Park fence. A maximum of 6 guests can enjoy the furnished house, air-conditioned, 2 bedrooms, 2 bathrooms, kitchen, lounge and patio. Kruger Wild View Guesthouse offering a superb view of the Kruger National Park and the big 5 often drinking from the Crocodile river. You will be awakened by the sounds and sights of rhinos, elephants, buffalos, lions, a leopard or two, hippos, hyenas, fish eagles and other wild life that can be viewed from the comfort of your private river facing patio. Views of the Kruger from your terrace. We saw elephants and buffalo several times. Hippos in the river. Nice bedrooms with good beds, good kitchen and comfortable furniture in and outside. The big plus is the location and the wildlife walking, swimming or flying past. If we are near Kruger again we will certainly be back! Kruger Wild View Guesthouse is 4.9km from the centre of Malelane , the nearest airport 43.6km (Kruger Mpumalanga International Airport).